Once Upon a Twilight! : We're excited to be heading to #NYCC! We're excited to be heading to #NYCC! New York Comic Con is tomorrow!! And we are beyond thrilled to be part of this EPIC adventure! As you all know, we are Twihards and tomorrow our main priority is Stephenie Meyer! She will be at NYCC and cannot wait to see her again. Join internationally bestselling author Stephenie Meyer in conversation with MTV's Josh Horowitz as they revisit the landmark novel Twilight, ten years later. The discussion will highlight the special tenth anniversary edition, including the original Twilight as well as exclusive new bonus content from Stephenie. Come celebrate the groundbreaking book that became a global phenomenon, a blockbuster film franchise and a cultural touchstone around the world. 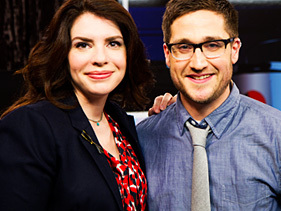 Remember our favorite reporter, Josh Horowitz? Well, he's asking questions to ask to Stephenie. If you remember from the past, he will get those questions we are dying to know the answer. So make sure to tweet your questions to him! So what do you guys want to hear from Stephenie Meyer about the new book? If you say something about Midnight Sun, you owe me a dollar.